After launching a second wave of airstrikes against the positions of Kurdistan Workers’ Party (PKK) militants, effectively ending a fragile two-year truce, Turkey has announced that it is calling a NATO meeting next week to discuss regional security concerns. Ankara sent bombers on a mission for a second night on Sunday to annihilate logistics positions, warehouses, barracks and PKK bases in northern Iraq. Ankara has claimed it is retaliation for PKK attacks against security forces and police last week. The country has subsequently called a NATO meeting to discuss its security concerns not only about Islamic State (IS, formerly ISIS/ISIL) but the PKK as well. 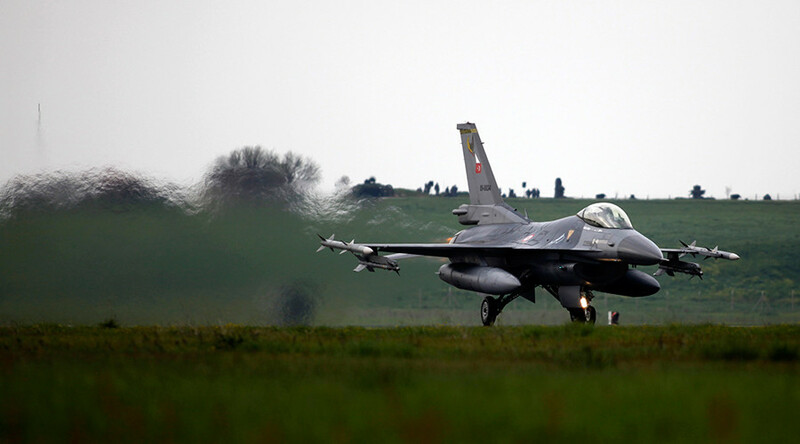 Four Turkish F-16 fighters took off from the Diyarbakir air base and hit PKK targets in Hakurk in northern Iraq, the sources told Reuters. Local media reports confirmed the airstrikes. “At around 9:00pm (6:00pm GMT), Turkish planes started bombing some of our positions in two areas [north of Dohuk and north of Arbil]”, a spokesman for the PKK in Iraq, Bakhtiar Dogan, told AFP. Some media reports claim that around 50 PKK camps were struck in three separate air operations and up to 300 bombs were dropped on PKK positions. Sunday airstrikes came as a military vehicle was struck by a car bomb and roadside explosives on a highway near Diyarbakir overnight on Sunday. According to the army, Kurdish militants then opened fire, wounding four soldiers. Six people were detained following the attack. According to Prime Minister Ahmet Davutoglu, Turkey, which launched its air campaign on Friday, is trying to tackle all “terrorist organizations,” not just Islamic State. For now however, Turkey does not intend to send ground troops into Syria to fight IS, Davutoglu said. Turkey is seeking to impose a “no-fly zone” or “safe zone” in northern Syria to secure its borders and stop refugees from flooding the country. “We have always defended safe zones and no-fly zones in Syria. People who have been displaced can be placed in those safe zones,” Foreign Minister Mevlut Cavusoglu said in a news conference on Sunday. Overall tensions have been flaring in Turkey the whole week after a suicide bombing in the mainly Kurdish town of Suruc killed 32 people and injured 100 last Monday. The terror attack caused a new eruption of violence, and protests engulfed the country with Kurdish groups blaming the government for not making enough of an effort to prevent the IS threat. On Saturday, the Turkish PM’s office announced their military campaign not only against IS but also against PKK – which Ankara considers a terrorist organization – but whose Kurdish forces in northern Iraq have been helping to curb the jihadist advances. Turkey fought against the PKK guerrillas, based in northern Iraq, for almost 30 years until reaching a fragile ceasefire in 2013. The PKK said the airstrikes had rendered the truce practically meaningless. But the Turkish government insists that negotiations continue despite air campaign. “We will continue the peace process… But everyone should know we will use both power and compassion,” said PM Davutoglu as quoted by Wall Street Journal. According to Davutoglu, since June the PKK has carried out some 280 terrorist attacks inside Turkey. “These elements needed to be responded to, and so they were. We will not allow anyone [to] threaten our democracy and public security,” he said. Just hours after Turkish warplanes pounded IS positions in Syria on Friday morning, Turkey approved the full use of its air bases by the US-led coalition against the Islamic State. Meanwhile Washington, despite its having relied on the Kurdish fighting militia as a fighting force on the ground, has supported Turkey's fight against the PKK. “The US of course recognizes the PKK specifically as a terrorist organization. And so, again, Turkey has a right to take action related to terrorist targets. And we certainly appreciate their interest in accelerating efforts against ISIL [ISIS],” White House spokesman Ben Rhodes, told a news conference in Nairobi. Meanwhile Turkey has equested a NATO ambassadorial meeting, as the country continues to simultaneously bomb Islamic State group positions near its border with Syria and Kurdish insurgents in northern Iraq. At the same time, European leaders expressed their support for Turkey’s role in fighting terrorism, but cautioned for the need to continue the investigation.